Whether you are a born and raised Granite Stater or you're just passing through, you probably know that NH prides itself on its fall foliage. New Hampshire is well known for its foliage and the beautiful colors that blanket the trees every autumn. Locals run around making visitors feel welcome and inviting them to local festivals, fairs and events. But between the fall festivals, Patriot's football season and apple and pumpkin picking, make sure you find some time to take a foliage drive. And remember to bring your camera because the foliage disappears as quickly as it appears. To find out when peak season is for the different regions, check out the NH Foliage Map, courtesy of the NH Department of Travel and Tourism. Yankee Magazine also has a great, live foliage report for all of New England as well as a free, downloadable mobile app. Amoskeag Millyard Scenic and Cultural Byway: Take Exit 5, Granite Street Bridge or Exit 6, Amoskeag Bridge to Commercial Street in Manchester. View the contrast of the old mills against the beauty of the foliage and flowing Merrimack River. Apple Way in Londonderry: Drive through Londonderry off of Route 128. This byway is special because of the luscious fields and agricultural area. Canterbury Shaker Village Byway: Get off at Exit 16 off I-93 and drive from Canterbury Shaker Village to Exit 18, I-93. This byway highlights Canterbury Shaker Village as well as conservation areas, open marshes, stonewalls, cemeteries, pre-Revolutionary homes, and access to Hutchins Forest. Currier & Ives Trail: Take Route 127 from north of Salisbury to Contoocook along Route 103 to Route 202/9 to below Henniker. This byway provides a taste of quintessential New England. General John Stark Scenic Byway: Drive along Route 114, Route 13 and Route 77. This is a 34 mile circular route that connects the towns of Goffstown, Dunbarton, Weare, and New Boston and is named in honor of New Hampshire's best known Revolutionary War hero, General John Stark. We recommend checking out the Sunapee Loop, which is approximately 140 miles. You can start or end this circular loop in Greenfield, where you can join the Monadnock Region Loop. From Greenfield, head north on Route 31 through Antrim and Hillsborough, past the Franklin Pierce Homestead (former home of the 14th U.S. President), through the towns of Windsor and Washington and past Pillsbury State Park. Just south of Goshen, you'll join Route 10; continue on to Newport and Grantham, where you'll turn on to Springfield Road, then Route 114 to Springfield. The route winds south through New London (home of Colby-Sawyer College), Sutton, Bradford and Henniker. Make sure you take a moment to check out New England College in Henniker. In Henniker, turn east on Route 202/9 to Hopkinton, where you'll pick up Jewel Road, also known as Route 13 through Goffstown to Route 136 (just north of New Boston), which leads back to Greenfield. the river the length of the western border of New Hampshire. 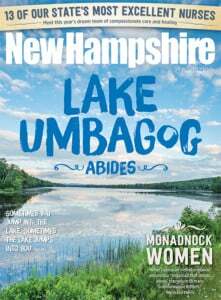 Lake Sunapee Scenic Byway: Travel along Routes 103 and 11 from Newbury to New London. Byway highlights include a state beach, wildlife refuge, scenic shoreline and year-round outdoor recreation. We recommend checking out this 80-mile circular loop (with two cut-outs) through some of the most quintessentially New England towns in New Hampshire. Start in Keene and head southeast on Route 101 to Marlborough, then go south on Route 124, which takes you past Monadnock State Park to Jaffrey. East of the town of Jaffrey, turn north on Route 123 to Peterborough then onto Route 136 to Greenfield. In Greenfield, you need to turn west on Forest Road, which rejoins Route 123 in Hancock. Continue west on 123; west of Stoddard you can either continue on Route 123 to much-photographed Marlow and the junction of Route 12A south, which will take you back to Keene. Or you can take Route 10 south past Gilsum, where you can either turn west on Surrey Road to Gilsum Road to Route 12A, or you can follow Route 10 south to Keene. The 135 mile Lakes Loop is a windy drive through the shores of Lake Winnipesauke and through the towns of Center Harbor and Moultonborough. Check out New Hampshire's lakes set against a dramatic backdrop of foliage and trees. From the town docks in Meredith on the shores of Lake Winnipesaukee, turn east on Route 25 to Center Harbor and Moultonborough, where you'll turn south on Route 109, a windy route that offers views of "big lake" as it takes you through Wolfeboro. Outside of the town of Wolfeboro, Route 109 turns east, passing Wentworth State Park, to Sanbornville were you join Route 153. Head north to Conway to join the Multi-Notch Mountain Ride, or to continue the Lakes Loop, follow it south through Union to Farmington and Route 11 east in Rochester. In Rochester, turn southwest on Route 202A to Northwood, where you'll briefly turn east on Route 4 to pick up Route 152 south. In Nottingham, pick up Route 156 to Raymond where you'll head north on Route 107 through Deerfield, Epsom, Pittsfield, Barnstead, Gilmanton and Laconia. Turn onto Route 3, which will take you back to Meredith. Branch River Valley Trail: The Branch River Valley Trail brings travelers through the small rural towns of Wakefield and Milton. Take in the stately Belknap Range as you wind through woodlands, open pastures and rivers. This byway travels along Routes 16, 125, 153 and other local roads from Milton to Wakefield, including a side trip on Applebee Road to Milton Mills. Lakes Region Tour: The Lakes Tour circles Lake Winnipesaukee, NH's largest lake, and offers grand views, lakeside villages and resort-type activities. The tour takes various turns, but one suggested route is to drive clockwise starting in Alton and head on to Alton Bay, Gilford, Weirs Beach, Meredith, Holderness, Center Harbor and Moultonborough. We love the seacoast for the obvious coastal reasons but we also love the seacoast for its rich history and culture. We recommend taking this great seacoast loop, about 40 miles long, through Portsmouth, New Castle and Hampton Beach. Start by taking Route 1B, which begins in Portsmouth's historic district, over the causeway to New Castle. This narrow route winds around the island, past the grand Wentworth-by-the-Sea and tow early military fortifications, Fort Stark and Fort Constitution; the latter was the site of the first aggressive act of the American Revolution. When Route 1B connects with Route 1A, turn south through Rye and North Hampton to Hampton; along the way you'll find Odiorne State Park and a series of State Parks with oceanfront beaches. In Hampton Beach, take Route 101 to Route 1 through Hampton Falls and Route 84, one of the region's earliest roads. It will take you through Kensington to Route 150 and Exeter, one of the four original towns in colonial New Hampshire and the state capitol during the Revolutionary War. From there, follow Route 27 along the original 18th century route back to Hampton. American Independence Byway: From Front Street in Exeter take a left on Pine Street to Route 150, Kensington to Route 84 east through Hampton Falls; Route 1 north to Hampton; Exeter Road (Route 27) to Exeter. Explore historic Exeter and Hampton, early colonial settlements, and Kensington with its Georgian and early Federal farms. Coastal Byway: Route 1A from Portsmouth to Seabrook. This byway is unique as it runs along New Hampshire's coastline while highlighting many historic sites. Arguably, the best foliage views can be seen from the White Mountains Region so below are various routes and loops that you can take. The whole loop is about 150 miles and takes travelers along the Kancamagus Highway and through White Mountain National Forest. If you're starting from Conway, turn west on Route 112, more commonly known as the Kancamagus Highway, which offers 37 miles of stunning mountain scenery through the White Mountain National Forest. In Lincoln, you can either turn north onto I-93 through Franconia Notch State Park and its mountain peaks, then onto Route 3 to Twin Mountain and the junction with Route 302 or you can continue west on Route 112 through Kinsman Notch to Route 302, which heads to Bath, Lisbon, Littleton, Bethlehem, Twin Mountain and Bretton Woods, home of the Mount Washington Hotel . Route 302 continues east through Crawford Notch and past some of the most spectacular scenery in the East. In Bartlett, you can turn south on Bear Notch Road, a seasonal road that connects to the Kancamagus Highway west of Conway ; or you can join Route 16 in Glen and follow it back to your starting point in Conway. If you turn north on Route 16 in Glen , you'll go through Pinkham Notch , past the Mt. Washington Auto Road the Ride to the Sky to Gorham and the Great North Woods Ride. Kancamagus Highway: Start on Route 112 and travel from Conway to Lincoln as 112 passes through part of the White Mountains Trail and the White Mountain National Forest. We love this byway because of its colonial history and forest ecology experiences offered along the way at the Russell Colbath Historic Site and Forest Discovery Trail. Presidential Range Tour: Take Route 116 from Littleton to Whitefield, then Route 3 to Lancaster to Route 2 East to Gorham, then Route 16 S to Glen, Route 302 W to Littleton. This byway offers four state parks, numerous scenic vistas and historic villages. White Mountain Trail: The White Mountain Trail is a 100-mile route offering rugged mountain scenery, three historic notches, 7 covered bridges, roadside waterfalls, 32 scenic outlooks and historic and interpretive sites. The trail loops from Route 302 to 16, 3, I-93 and 112. Although the Great North Woods is less populated than other NH regions, it's filled with many opportunities to see wildlife including moose, black bear and deer this section of New Hampshire is a must-see for nature lovers. This drive is about 120 miles and takes travelers through Gorham and Berlin. Start your loop by continuing on Route 16 through Milan and the beautiful Thirteen Mile Woods to Errol, where you'll turn west on Route 26 through Dixville Notch, past the famous Balsams Resort, to Colebrook; this stretch is curvaceous and spectacularly scenic. When you get into Colebrook, turn south on Route 3 and stop for some photos and serenity at the Shrine of our Lady of Grace, then continue, following the winding Connecticut River. When you arrive in Groveton, turn east on Route 110 to Stark, famous for its picture-perfect covered bridge, and back to Berlin. Connecticut River Byway: This byway begins at Fourth Connecticut Lake near the Canadian border and follows the river the length of the western border of New Hampshire. Moose Path Trail: Take this byway Route 16 north from Gorham to Errol; Route 26 to Dixville Notch to Route 3 north to Pittsburg. This wilderness byway is ideal for the outdoor enthusiast so make sure you pack your hiking shoes or bike.